Bad apples are employees who cause problems, reduce productivity, or have a negative impact on morale. These types of workers come with a variety of traits, personalities and problems. Most managers are well-equipped to handle problems with sales, production, negotiations, or suppliers, but almost universally, managers feel inadequate when it comes to solving personality problems or person-to-person conflicts. And these often have the biggest influence on productivity in the workplace. Some easy to recognize signs of a troublesome employee include tardiness, leaving work early, failing to follow instructions, argumentativeness, and inability to take direction well. The best test for a bad employee is to ask if he negatively affects the company’s bottom line. Whatever he is doing (or not doing) can make it harder for other people to get their work done, or for him to complete his. Some types of bad apples include backstabbers, passive-aggressives, liars, bullies, whiners, career climbers, gossips, laziness and more. The ultimate outcome of the employee’s attitude or behavior is that the company does not succeed as well as it could have. When it comes down to it, employees are primarily valuable to the company because of the work they accomplish which helps the company make money. There may be employees who work for you that you don’t like, find annoying, or whom other people dislike, but the ultimate test of whether they are bad apples is how they impact productivity. You need to look not only at that employee’s own productivity, but at how she influences productivity for the entire company. An employee who does not do his job well is an obvious problem, but one that drains the resources of the company from other employees is not as easy to spot sometimes. Just as there are lots of behavior that qualifies as problematic, there are many reasons that can explain bad apple behavior. If you can pinpoint and understand the reasons behind your employee’s actions (or inactions), you’ll be in a better position to be able to solve the problem. - she has basic personality traits that are just incompatible with the job or company. The best way to find out the reason behind your employee’s behavior is simply to talk to her. Find out what her concerns are, how she feels, and what’s going on in her life. It’s impossible to properly correct something if you can’t identify the cause and sometimes we as managers tend to over think things when there really is a simple explanation. If you have an employee who is not turning in projects on time, you could extrapolate all sorts of complicated reasons for this – she can’t work with the new version of the software, she’s trying to make you look bad, and so on, when the explanation might be as simple as the fact that another manager is giving her work that is more urgent. Find the root of the problem and you can then fix it. Unless you understand the core cause of the problem, you might end up just solving a symptom, but not resolving the underlying issue. A solution that deals only with the symptoms is going to be an incomplete solution. If you spackle over a cracked wall in your house you can mask the problem, but it will simply crack again if you have a shifting foundation that needs to be repaired. Your employee is in the same situation. You can temporarily change some behaviors, but if the root cause of the problem remains untouched, you’re likely to experience problems with this employee over and over again. You won’t always be able to completely fix the problem, but understanding the cause can help you be a more effective manager. To change a bad apple, first talk to the employee and the team. Find out what is going on. Take some time to observe and create your own conclusions. Next, think about what might be creating the situation. You might have a situation where two people are incompatible or your employee has been placed in a situation that is outside her area of skill or confidence. If you can identify and isolate a situation or problem that is contributing to the behavior, you have a much better chance of creating a solution for it. If the problem is inherent to the employee’s attitude or personality, first demonstrate the benefits of being a good employee by rewarding other employees. Demonstrate the consequences of bad apple behavior – follow your company protocol for write-ups and discipline. Talk to him about what the problem is, but do so in a way that shows you want to work together to solve the problem. Be prepared to really listen to your employee’s explanations and feedback. Create a goal for the problem employee. Don’t step back and expect him to get there himself – help him reach the goal. Doing so ensures success and shows you are on his side. Provide real suggestions and tips and always give positive feedback as you move along. 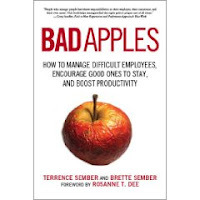 Terry Sember is a management consultant and author of Bad Apples: Managing Difficult Employees (Adams Media) and The Essential Supervisor’s Handbook (Career Press). Visit http://www.managingbadapples.com/. One thing I'd like to add is to ensure your "problem" person, well really, all your people know your expectations along with those of the company. Sometimes a perceived bad apple can be someone who is doesn't understand completely what he or she needs to do. I think the point is touched on at the beginning of "understanding bad apple behavior", but I think the whole "expectation" thing could be hit even harder because it's something we so often miss when managing others. With all due respect, I despise this talk of "bad apples". It reeks of the fundamental attribution error. Even though the author discusses evaluation of root causes, which by the way are often always systemic and therefore controlled by management, people that buy into this stuff will see it as a license to blame, and as Deming told us that is the abdication of management. RJ Hall's comment are along these lines as well. I think that this post brings out alot of good points and it is definitely true that alot of leaders will think up all kinds of crazy reasons (at first) about why their subordinate is a "bad apple," when the reality is that the cause of problem is probably much more simple. However, I must respectfully put forth the opinion that there are sometimes legitimate "bad apples" that need to be removed from the bushell. Many argue that as much as 10% of all employees are "bad apples." I don't think that number is that high, but I do think that the basic premise is correct. However, there are still plenty of people that argue that "there are no bad subordinates, only bad leaders." I think that the basic difference of opinion here can be attributed to a difference in opinion about how far the leadership of an organization should go in accomodating a "bad apple," and rehabilitating them. I personally believe that if somebody signs on to an organization then they have an obligation to do their best to fit into it. After all, would you seek to change a leader who has a stellar record just because they just cannot get along with one particular subordinate? In most cases, no, and the subordinate should be moved or let go. Here is the reality. People are too diverse, and too numerous, to believe that, if you try hard enough, anyone can effectively lead anyone. Sometimes it is just best for the whole to let somebody go. I have to line up with Bret on this one. To start from "bad apples," even if you backtrack to analysis sets things up to blame instead of solve the problem. The process outline in my Working Supervisor's Support Kit is something like this. You have a person who is not performing. There's a slightly different process for behavior issues. They are not performing for one of two reasons. Either they can't perform or they won't. A surprising amount of time the situation is that they can't, either because they shouldn't be in that job (a bad hire) or because they lack the resources or training necessary. This is almost always true if the performance issue is task-specific. If they can't perform, they need training, resources or re-assignment. What if they have all that and still don't perform? Then you've got to dig deeper. It may be that there's an issue you don't know about. Or it may be that the person is choosing not to do the job properly. If that's the case you need to offer an opportunity to reform and document performance. Consequences may be in order. The article really did a nice job of identifying, spotting and responsibly addressing people’s whose behavior is not aiding a company or organization to move forward. I am sure it was alluded to in the article, but I would like to add that a measurable definition of what the preferred state is desirable too. This way when a meeting with the employee is done the focus can be more positive and focus on what is expected. In addition if during the meeting it surfaces that one of the problems is that the employee is at odds with what is valued by his superior or the company then time can be spent determining if a bridge can be built between the value systems. I also liked that it was pointed out the necessity of observing the situation before acting. However in addition to the other environmental factors that were listed I would like to add organizational culture. The really bad apple in some cases may be the culture of the organization. I have two examples where the company’s culture affected employee behavior. There was a company whose sales policy was that the sales people had to develop their own leads. However over time sales people came on board who developed an excellent sales rate, but they disdained creating leads. The company than begin shifting its policy to assign the attaining of leads of strong closers to junior sales people and service staff. This, in turn, led to discontent all who were not benefitting from change in expectations. Another example is an air manufacturing firm’s profits and production suffered because of inconsistency between what they said they valued and what they rewarded. Their formal value was cost saving through innovation. However innovation was only rewarded if it was a new idea. Engineers who were able to find previous designs and adapt them with a few changes to fit a current need were not rewarded. Additionally managers were compensated according to the size of the division they directed; consequently if an innovative cost saving measure was developed it was suppressed whenever it would mean a reduction in manpower. Both situations created people who were not as productive as they could be, who learned to play the game, and who were discontent. In fact, it created people who then put forth minimal effort to real productivity. These, in turn, became “bad apples” but a large portion of the blame rested on the upper management who allowed a contradictory situation to exist. My favorite parts of the article are the importance of interviewing not just assuming, observing the environment, and the practical manner of dealing with a “bad apple”. Observation, communication, and commonsense steps are important in all relationships whether it is boss to employee, business to vendor or spouse to spouse. Thanks for adding your thoughts to the conversation. You've all made valid points. From my perspective, I think we tend to spend way too much time on managing what I call "C" players (the author refers to as "bad apples"). These 10% tend to take up 90% of a leader's time. Sure, clarify the expectations, provide coaching or training, but at some point, it's time to help them move to a role where they can be successful. True, if they really end up being "C" players. We don't know that until we've done our due diligence. After we're sure we're not part of the problem, "turf 'em", like you said.